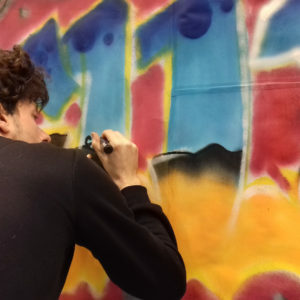 Graffiti Paris offers different Street Art experiences in Paris : public workshops, private lessons, creative team buildings, educationnal workshops and guided tours. Our team of artists can also perform frescoes for your projets as well as Street Art Live Painting performances for your events. Experience Street Art in Paris through the realization of a mural graffiti with an artist in an urban setting. 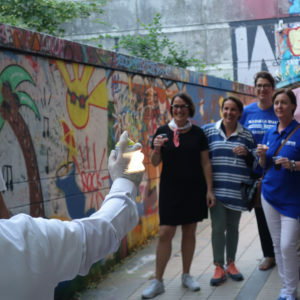 Federate your teams through a creative and original team building approach by practicing graffiti. Educational street art and graphics arts workshop, adapted to young people and designed for educational organizations. The Graffiti Paris Street Art Tour is the perfect way to discover Paris under a new eye through the exploration of this art. Creation of custom frescoes for all your creative projects inside or outside. For all your events, our artists propose you to perform a session of Live Painting (live artistic animation). 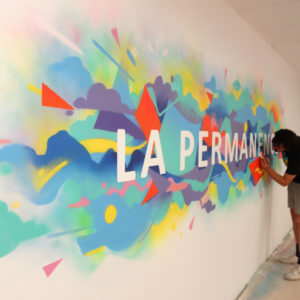 Copyright © 2019 Graffiti Paris – Powered by Customify.